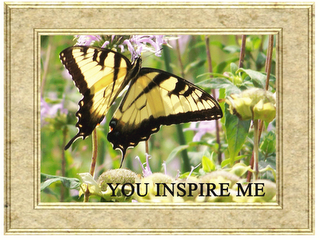 Skipping Stones Design – My Cardz ~ My Passion . . .
Our challenge this week has been brought to us by my friend, the awesome Lisa Cook of the HMDT. Lisa has provided us with this cute little cupcake mouse for our inspiration. Well, I took two main items from this photo ~ a mouse with a bow in her hair and a cupcake with turquoise frosting . . . and came up with this action shot! 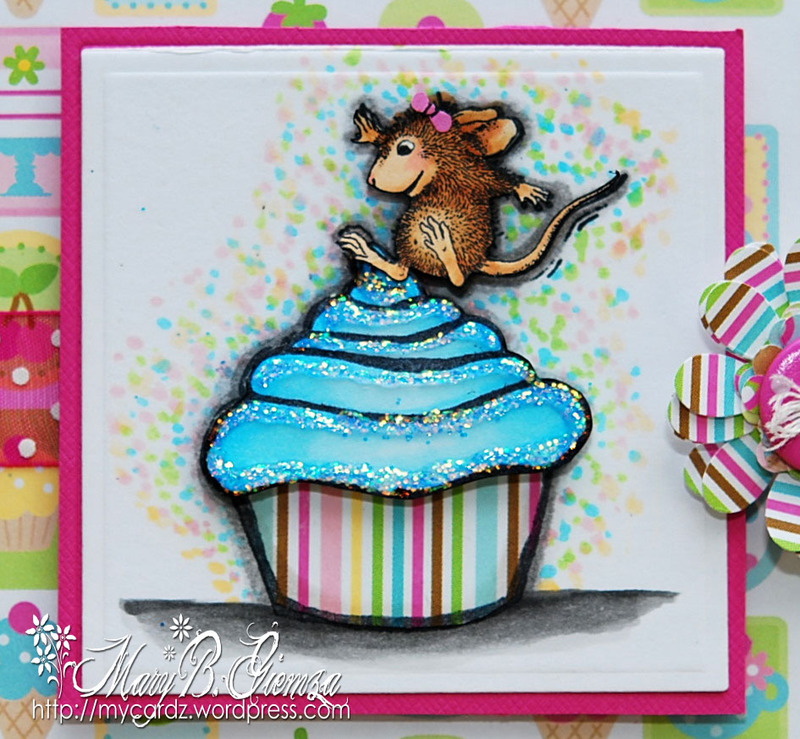 I’ve used a combination of images for this one ~ Skipping Stones Design cupcake and sentiment, along with little Monica from the stamp called Mouse Bounce, and of course added a little bow to cute little Monica’s hair! Hope this made you smile! 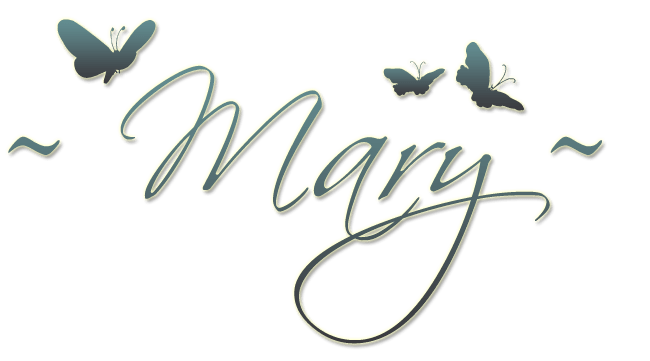 As usual, the details for this challenge and this week’s prize, along with the always adorable creations from the House Mouse Design Team, can be found on the House Mouse & Friends Monday Challenge blog. Thanks for your visit today – have a great week! And here’s my card . . . I haven’t had breakfast yet and, for some reason, am craving something SWEET! 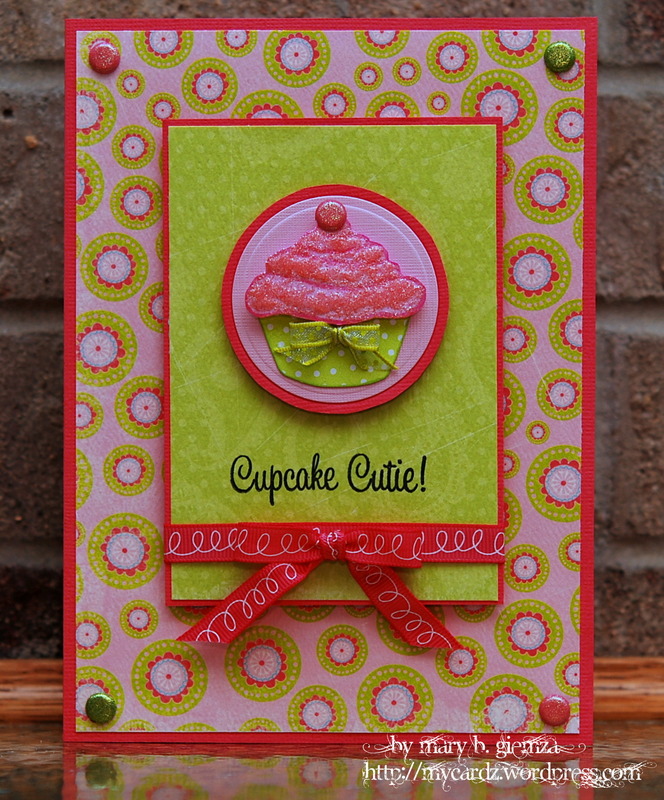 😀 This “Cupcake Cutie” is from the stamp set with the same name. I added some Cotton Candy Stickles to the frosting … mmmmm looks like sugar! 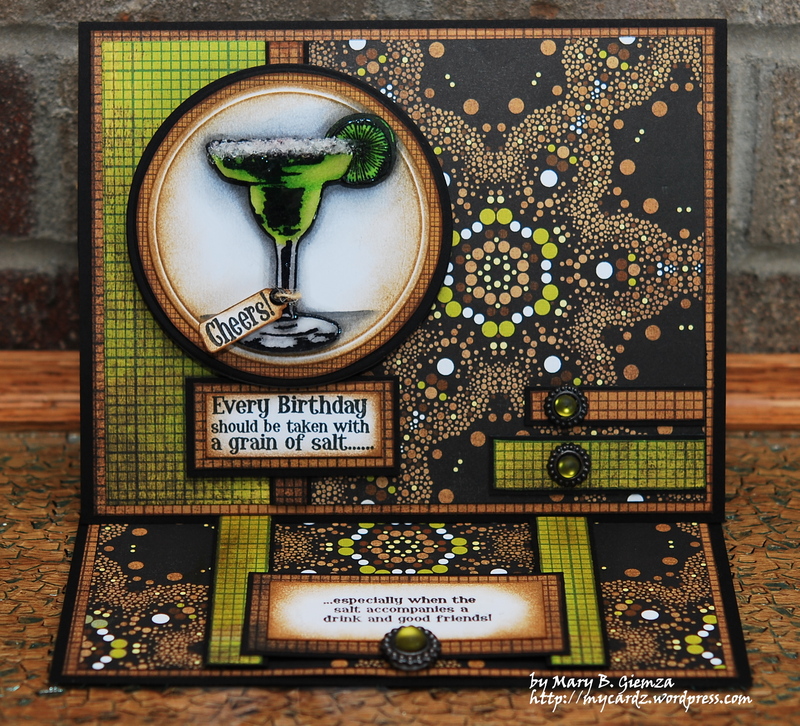 The DP used for this card is from My Mind’s Eye ~ the pink is from the Abbey Road collection and the green is from Penny Lane. I added some “sugared” (now I’m really hungry!) brads in each corner and one on top of the cupcake. GOOD NEWS – Skipping Stones Design is having a P.M.S. Sale! P.M.S.~ in this case~suffering from the NEED to Purchase More Stamps! All the details on this sale and the fantastic cards from the Design Team can be found on the Skipping Stones blog. 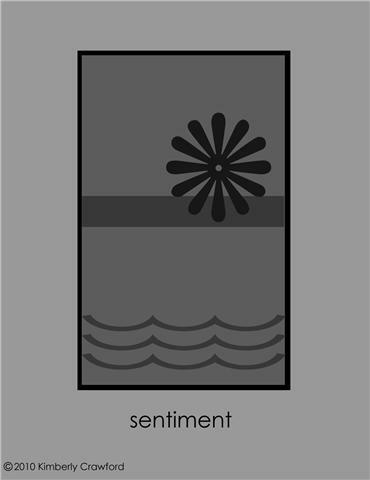 I’m sad to say this is my last card as a Design Team member for Skipping Stones. I’ve had to rearrange a few things on my schedule which has been over-flowing recently. 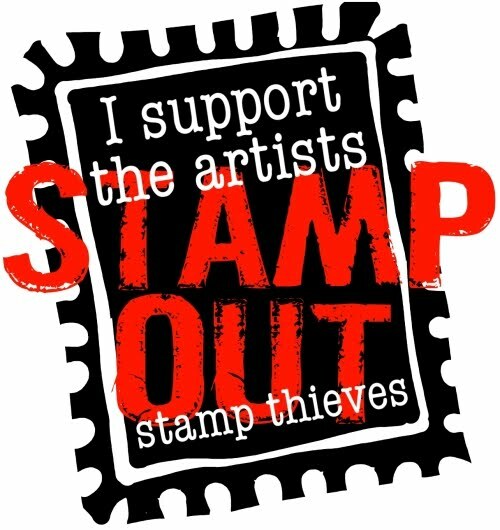 But, I will definitely be keeping a close eye on all the new and hilarious stamps that the wonderfully talented and sooooooo very nice Heather produces for Skipping Stones Design! 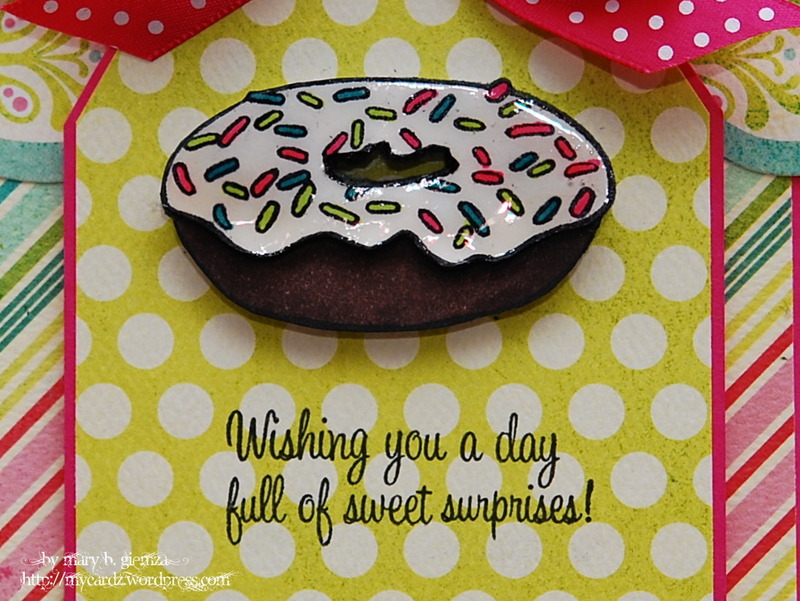 Welcome to another Skipping Stones Design Blog DT Blog Hop to celebrate the release of two new stamp sets ~ Birthday Donuts and Whispering Wings. If you just happened upon my blog today, you’ll want to go back to the beginning at Skipping Stones Design. You should have arrived from Ashley Cannon Newell’s blog. Combined with the blog hop today, it’s also Skipping Stones Sketch Tuesday which means the Design Team is showcasing another great Sketch creation from Kimberly Crawford. 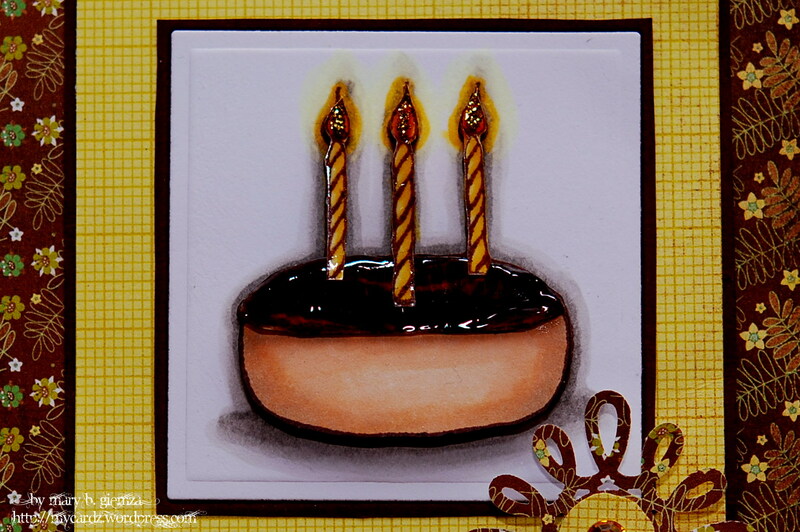 The donut and sentiment on this card are from the new Birthday Donuts stamp set. The dp used is from the My Mind’s Eye Quite Contrary Collection. I added some Diamond Glaze to the donut to, hopefully, look like real frosting! We’d love for you to play along with the sketch. Just remember to use the keywords SSD020 if you are uploading to any online galleries or link your card at the Skipping Stones Blog. We’ll be looking soon for Guest Designers so you never know…. Time for a new Sketch Challenge at Skipping Stones Designs. We also have a new Sketch Designer for this month ~ Kimberly Crawford. Here’s her first Sketch . . . 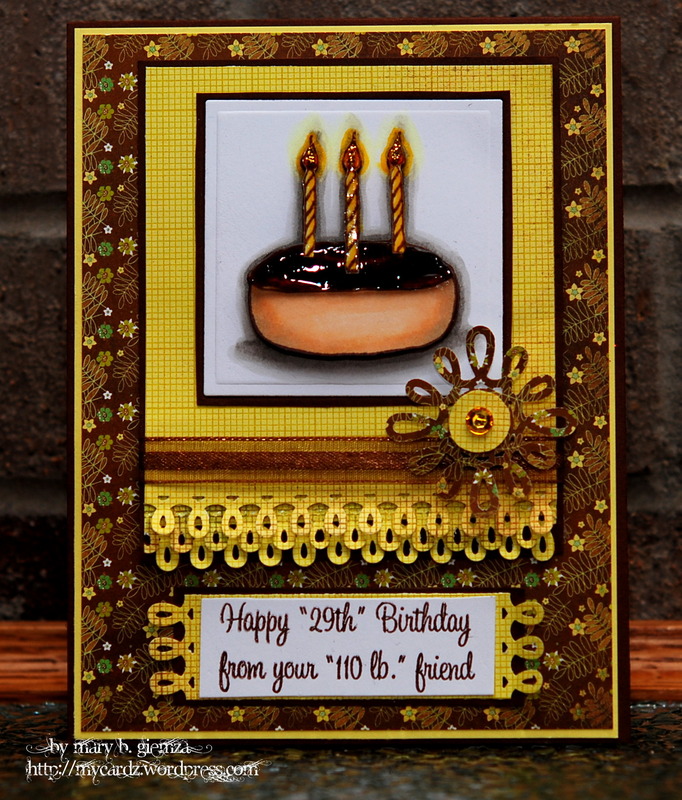 I used the donut from the Birthday Donuts stamp set which will be available next Tuesday, April 13th! I love the matching sentiment! Be sure to stop over at the Skipping Stones blog for more sneak peeks of this set and another new one ~ Whispering Wings, from the amazing Skipping Stones Stamp Tramps! We also have two Guest Designers joining us this month, Beverly Rousch and Ashley Cannon Newell. 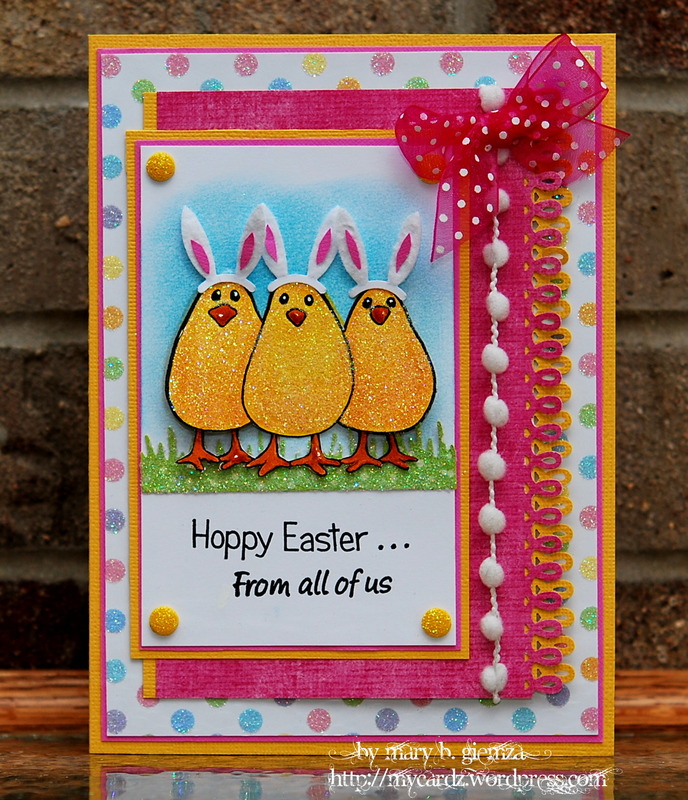 Had to share one last Easter item with you using the Skipping Stones Chick Chat set! 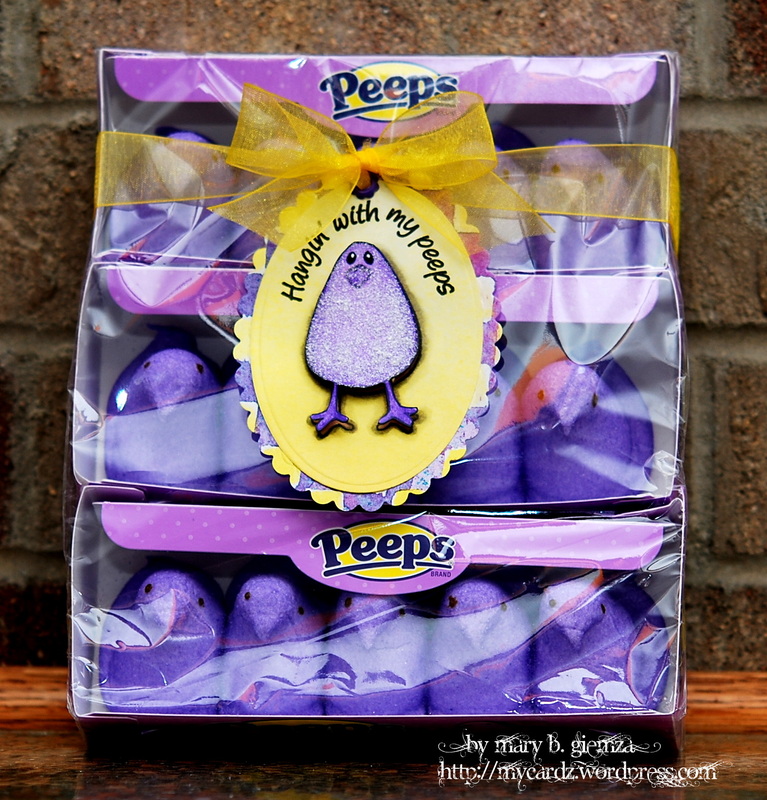 Being the purple-aholic that I am, I thought this tag would be perfect for these Peeps! Time for a new Sketch for Skipping Stones Design! 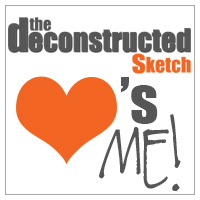 Unfortunately, it’s our last sketch designed by the awesome Jami Bova ~ she definitely is a pro at sketch design and this last one is my all-time favorite!! The dp is from the DCWV All Dressed Up stack ~ it’s actually black and cream, but looks very white in the photos. Each accessory was heat embossed, colored with ONE Copic marker – E50 (that’s a first for me! 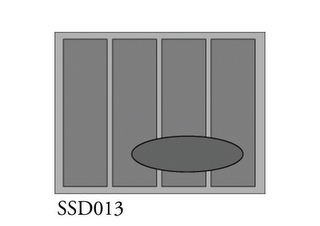 ), cut out and attached with dimensionals. I added some Judkins Diamond Glaze and a black rhinestone to the purse; But my favorite is the shoe on the left, I added some clear beads to make it look like a beaded flower! 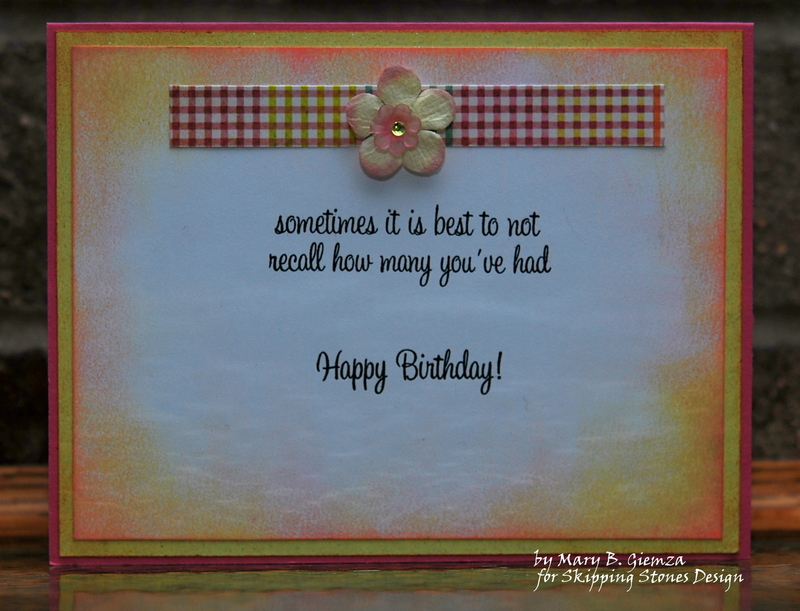 I hope you can stop at the Skipping Stones Design blog to take a peek at all the awesome cards using Jami’s sketch. And if you haven’t already, be sure to sign-up for the Skipping Stones Newsletter! 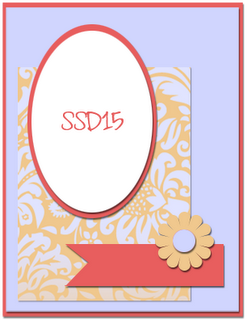 (You can do so by just filing in your name and email address on the form found on the left side of the SSD blog.) This week’s Newsletter (scheduled to go out on Thursday) will give you details on how to get the new Bras Vol. #2 stamp set for Free ~ before it is available for purchase. Skipping Stones Sketch Challenge No. 17 ~ Dark Chocolate or White Chocolate?? Another new Sketch Tuesday over at Skipping Stones Design! In honor of the upcoming Easter holiday, I thought these Bitten Bunnies would be perfect for a card. They are from the Skipping Stones Chocolate #1 set – I think that means there will be more coming! I thought it would be fun to have one dark chocolate and one white chocolate bunny ~ unfortunately, the white bunny’s face just doesn’t show up too well in the photos. Each was covered with a coat of Diamond Glaze to look a little authentic. 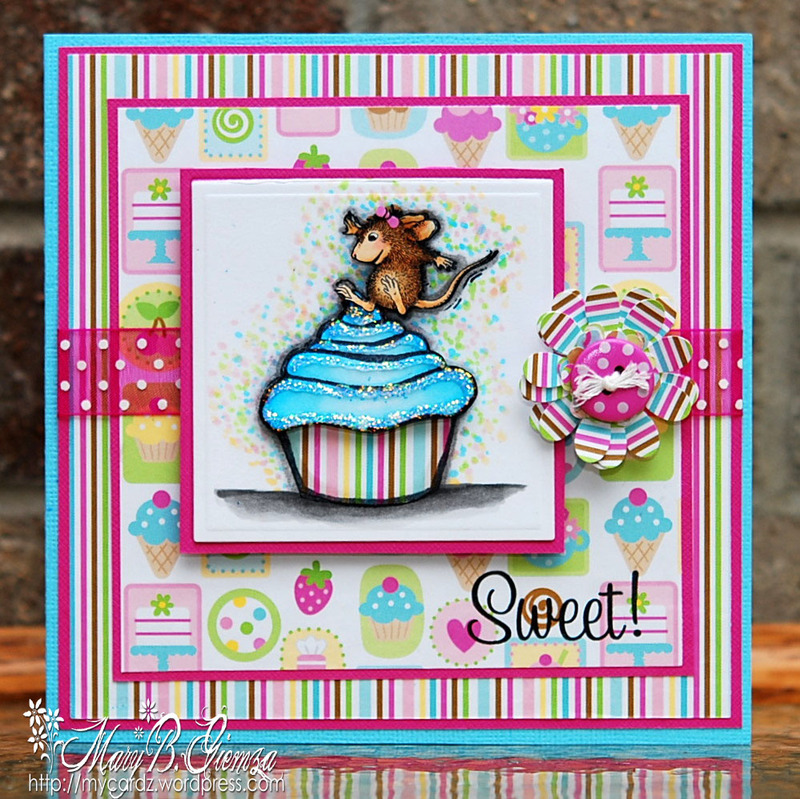 I hope you can stop over at the Skipping Stones’ blog to check out all the other awesome cards using Jami’s sketch, and I hope you can join us for a chance to win some stamps! 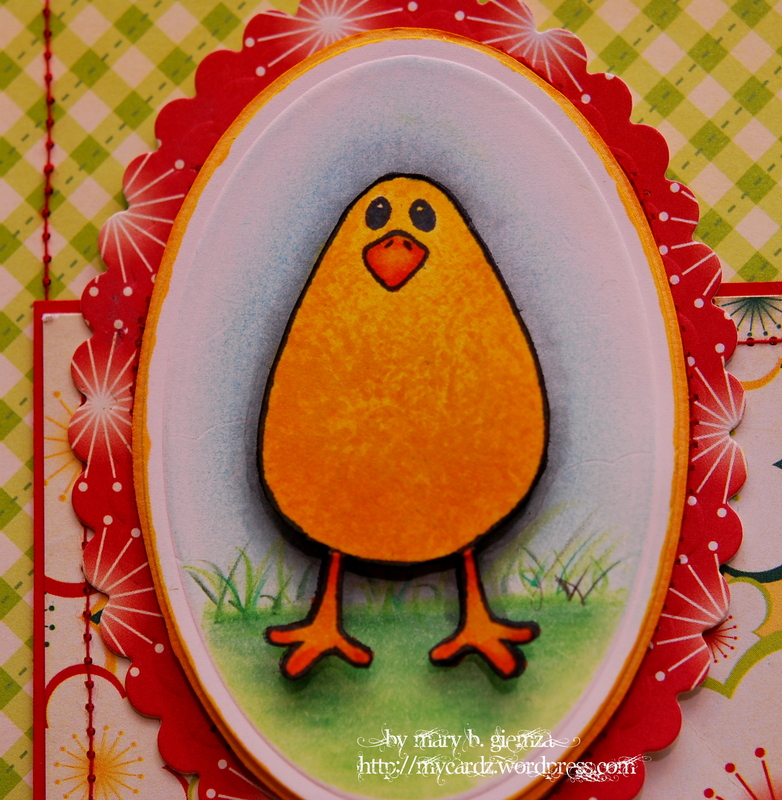 Skipping Stones New Release Blog Hop ~ Easter Peeps! Yep, you’re in the right place! 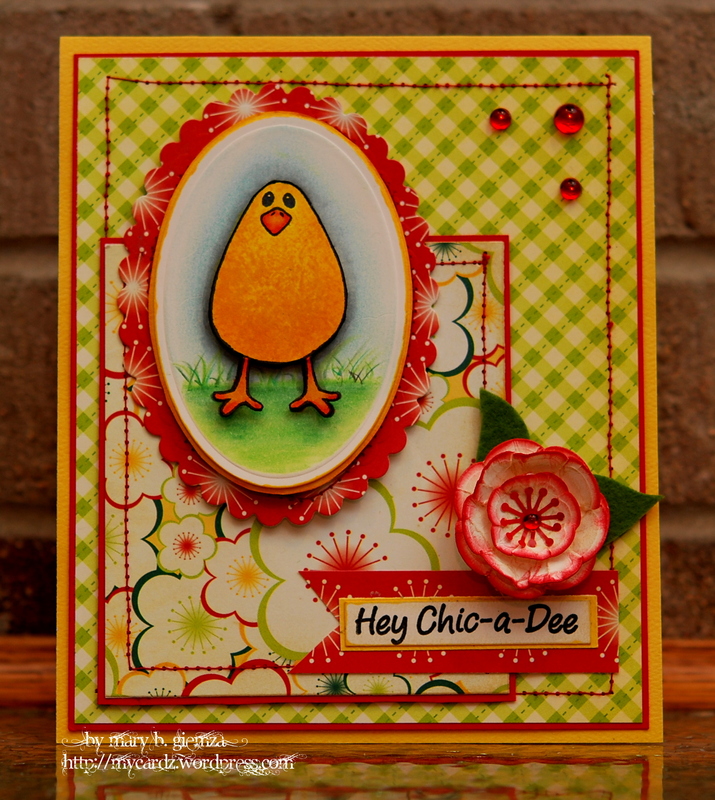 Welcome to Skipping Stones Design’s first DT only Blog Hop to celebrate the release of two new Spring/Easter Inspired sets ~ Chick Chat & Gray Hares. If you just happened to stop here today, you’ll want to go back to the beginning at Skipping Stones Design. You should have arrived from the awesome Sankari Wegman ‘s blog. Combined with the blog hop today, it’s also Skipping Stones Sketch Tuesday which means the Design Team is showcasing another great Sketch creation from the one and only ~ Jami Bova aka SgtStamper. Here’s my Easter Peeps card . 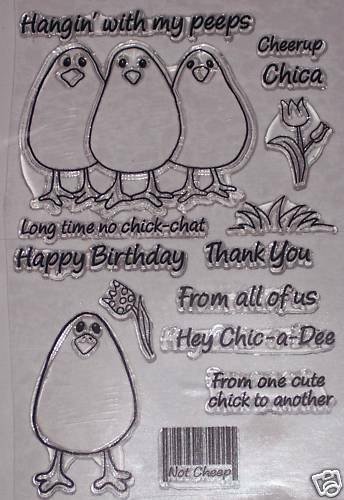 . .
As you can see, I’ve used the too-funny Chick Chat stamp set for my card. I decided to have the PEEPS dressed for Easter thanks to the new Martha Stewart Bunny Ears punch! 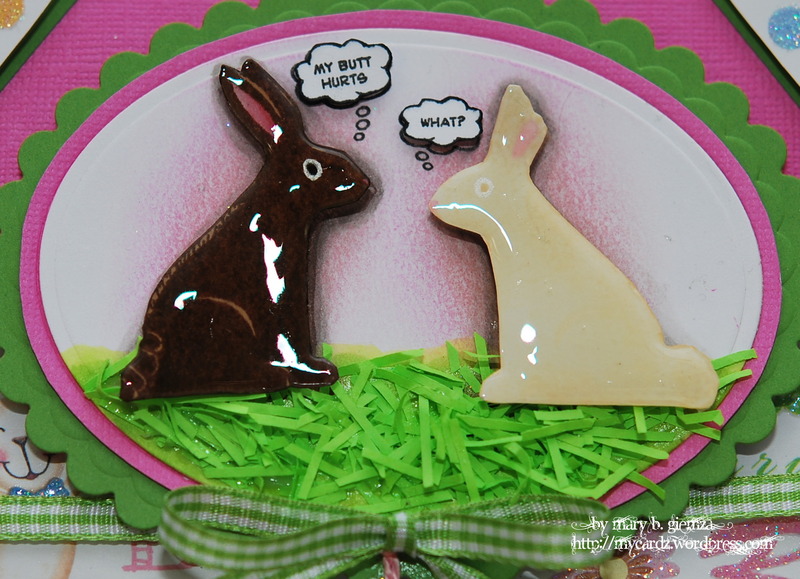 I also used the Hoppy Easter sentiment from the new Gray Hares set and the from all of us from the Chick Chat set. 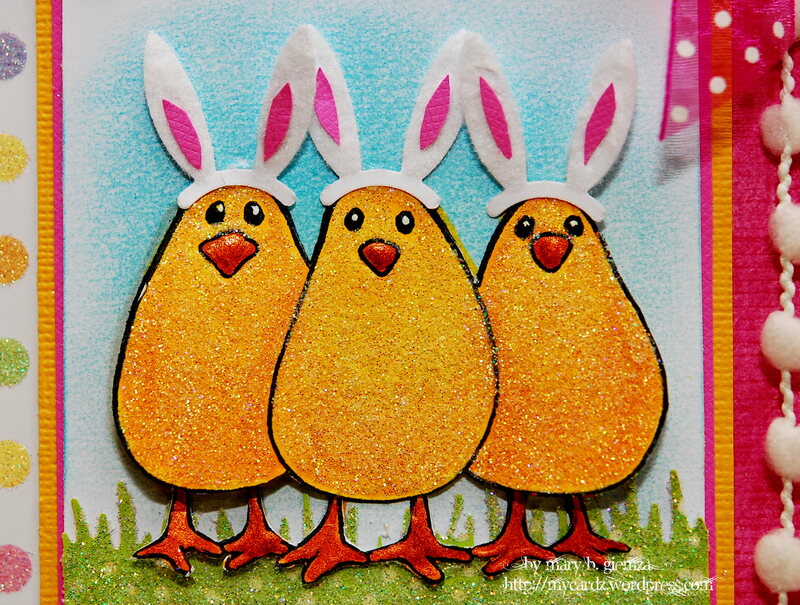 The peeps were colored with Copics and then covered with glitter! I added some Smooch pumpkin pearlized paint to their beaks and feet, the trim was used since it seems to remind me of bunny tails! 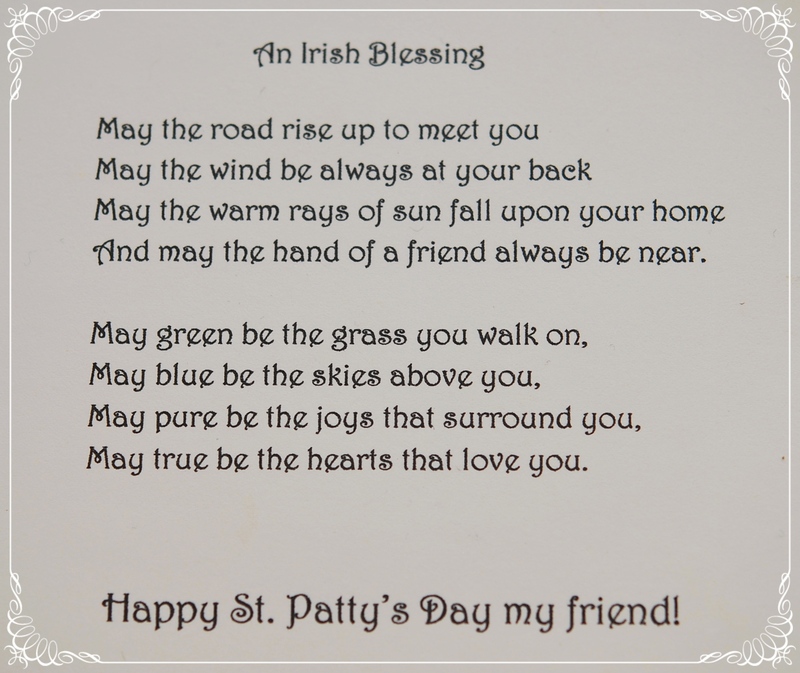 Well, this was certainly a Martha day for me ~ I also used the Loop edge punch and Spring Grass punch for this card. We’d love for you to play along with the sketch. 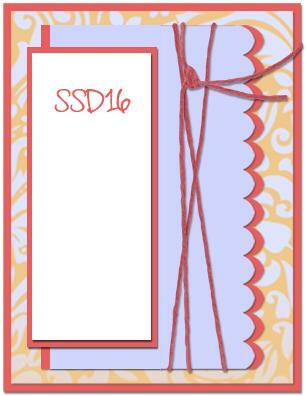 Just remember to use the keywords SSD016 if you are uploading to any online galleries or link your card at the Skipping Stones Blog. We’ll be looking soon for Guest Designers, so you never know…. How about a prize? 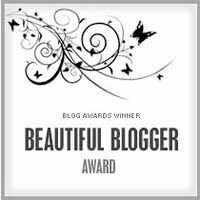 In addition to the fabulous eye candy, our DT has blog candy up for grabs. So as you hop, make sure you leave comments on every post so you have a chance to win!! Thanks for dropping by today ~ Your next stop is the very talented Chelsea Van Wyk. Skipping Stones Sketch Challenge No. 15 ~ It’s a Sneak Peep! Welcome! Time for a new Sketch Challenge at Skipping Stones Design. I’m VERY excited about the challenges this month since we are soooo lucky to have my very dear friend – the super talented and amazing JAMI BOVA as our Guest Sketch Designer !!! And, she definitely did not disappoint! Here’s this week’s awesome Sketch . . .
For my card, you will getting a sneak “PEEP” at a fun new stamp set from Skipping Stones, scheduled to be released mid-March. It’s called Chick Chat. This little peep was colored with Copics and then I used Marianne Walker’s “nasty rag” technique to give her a little dimension. The grass was added with colored pencils and gamsol. The dp used is from Cosmo Cricket – Garden Variety. For some reason, I decided to dust off the old sewing machine for this one – unfortunately, I still can’t sew very straight! I even attempted to stitch around the scalloped oval – which was then covered by my image! lol I tried. 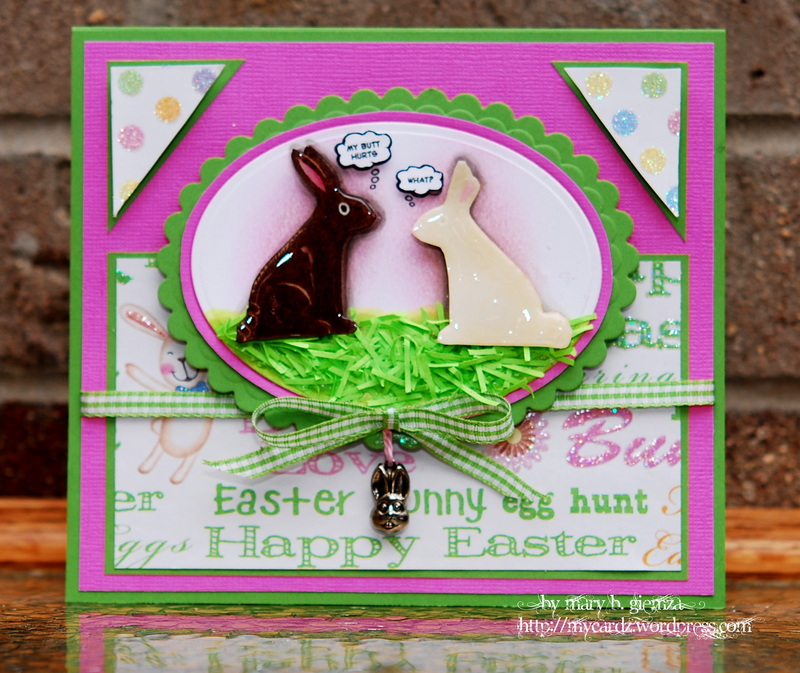 So hop over the Skipping Stones blog to take a PEEP at all the lovely creations for this challenge, by the awesome Skipping Stones Stamp Tramps! Hi! Time for another Sketch Challenge at Skipping Stones Design. 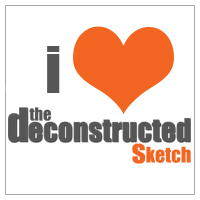 Our Sketch was once again designed by Belinda of Bleu Bella Paperie. I really love this Sketch and will definitely be saving it to use again. 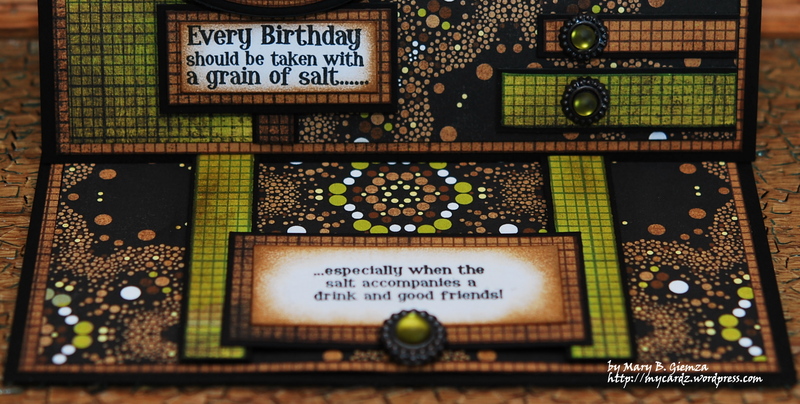 For my card, I used the Rustic Tiles stamp set from SSD. 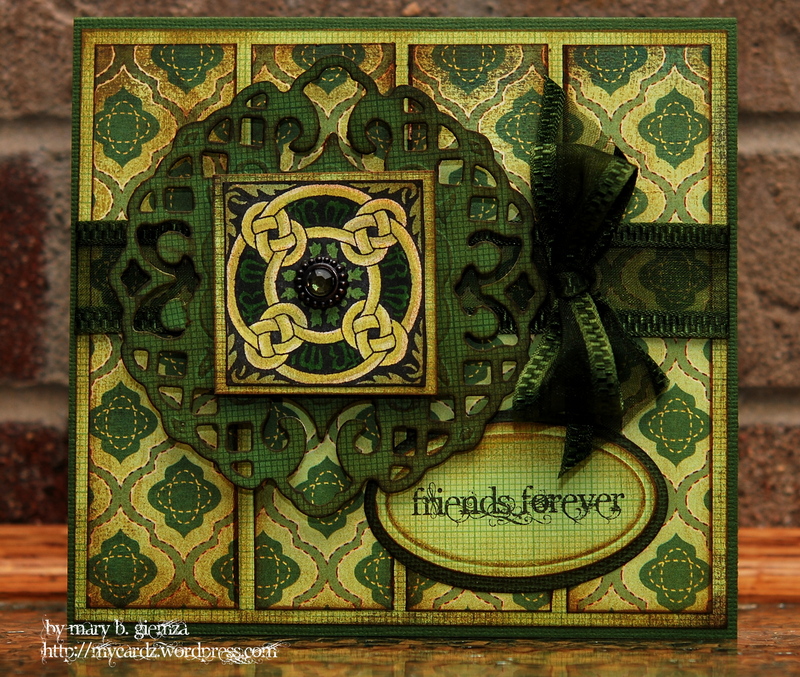 When I saw the first tile, it really reminded me of a Celtic Knot design – so, I decided to use it for a St. Patty’s Day card. I hope you aren’t tired of seeing my cardz using the new Basic Grey origins paper ~ I really love it!! 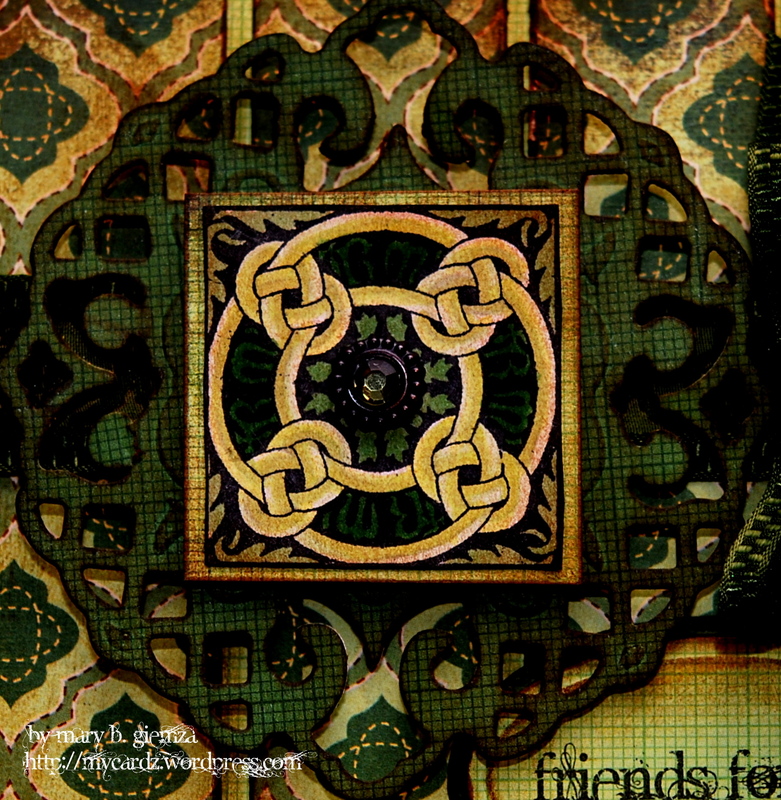 The tile was colored with Copics and then edged with Distress Ink in Vintage Photo. I also used the Spellbinders Shapeabilities Pendants Lattice die to mount the tile on and added a brad from Vintage brads by Creative Charms. The ribbon is from an awesome package of goodies I received from my dear friend America. 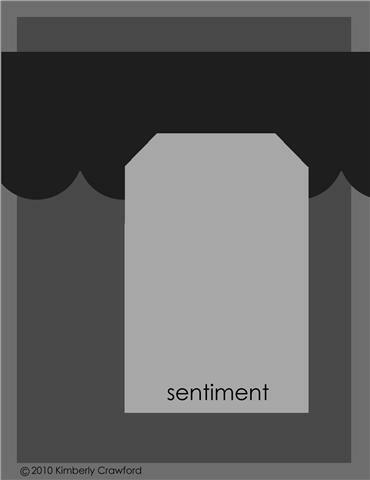 The sentiment is computer generated. Be sure to stop over at the Skipping Stones’ blog to check out all the amazing cards by the Design Team – a/k/a The Stamp Tramps! I hope you will give this Sketch a try! Hi! I just wanted to be sure everyone has the E-Bay link where all the GORGEOUS Skipping Stones Design cards are being auctioned off. Don’t forget, all proceeds will be going to the Red Cross Haiti disaster Relief fund! 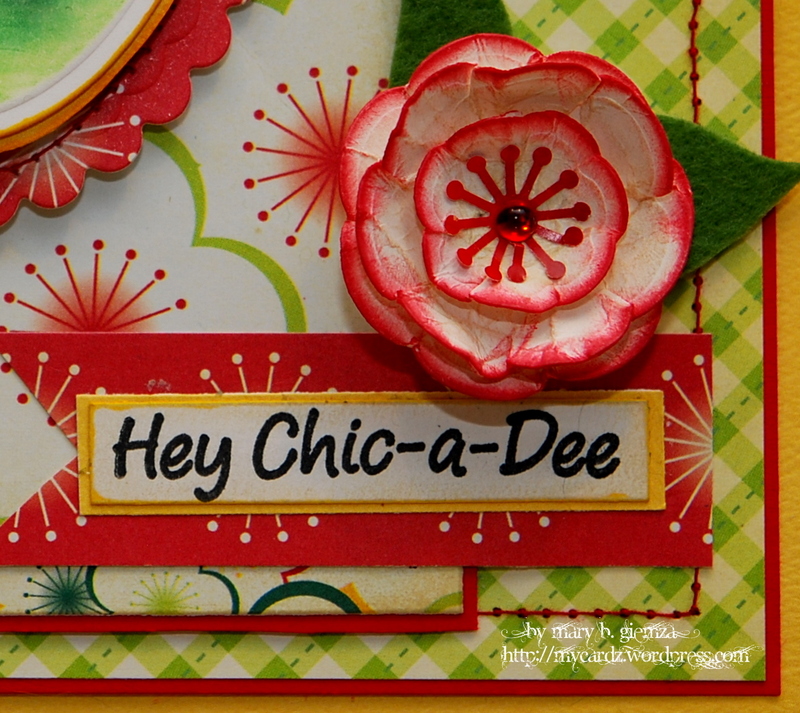 Special thanks to everyone who joined us for the blog hop! Welcome to Skipping Stones Design’s Blog Hop(e) for Haiti. If you just happened upon my blog today, you’ll want to go back to the beginning at Skipping Stones Design. 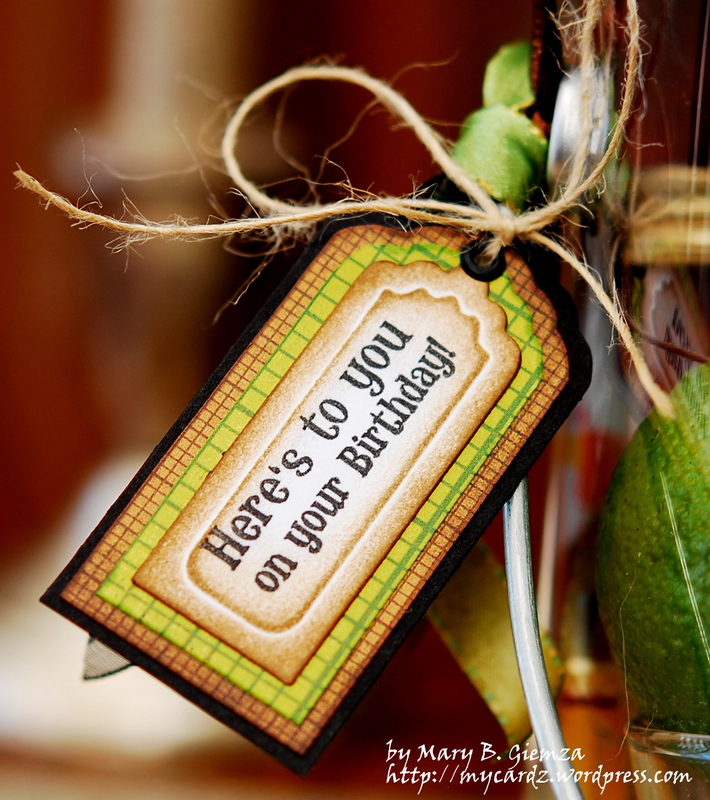 You should have come from Sharon Perry’s blog. As a company and Design Team, we wanted to do something to give back to the people who have been so devastated by the Haitian Earthquake. 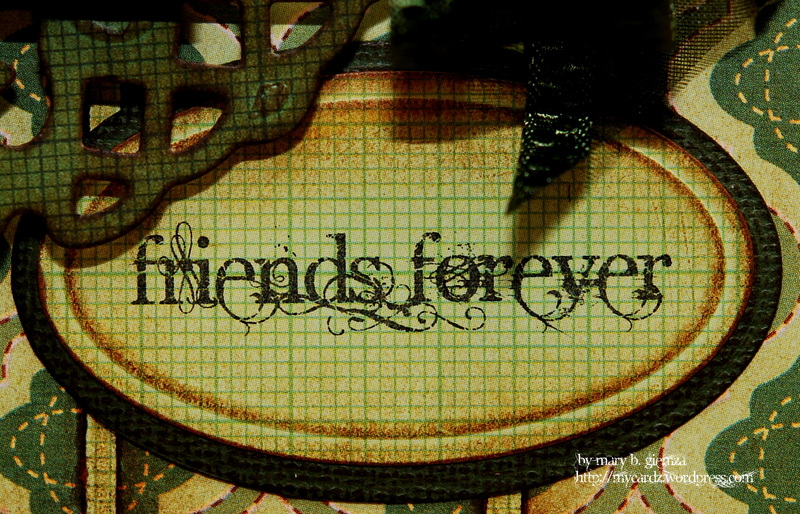 So we thought what better way than to invite some of our favorite fabulous stampers to join us in this cause. 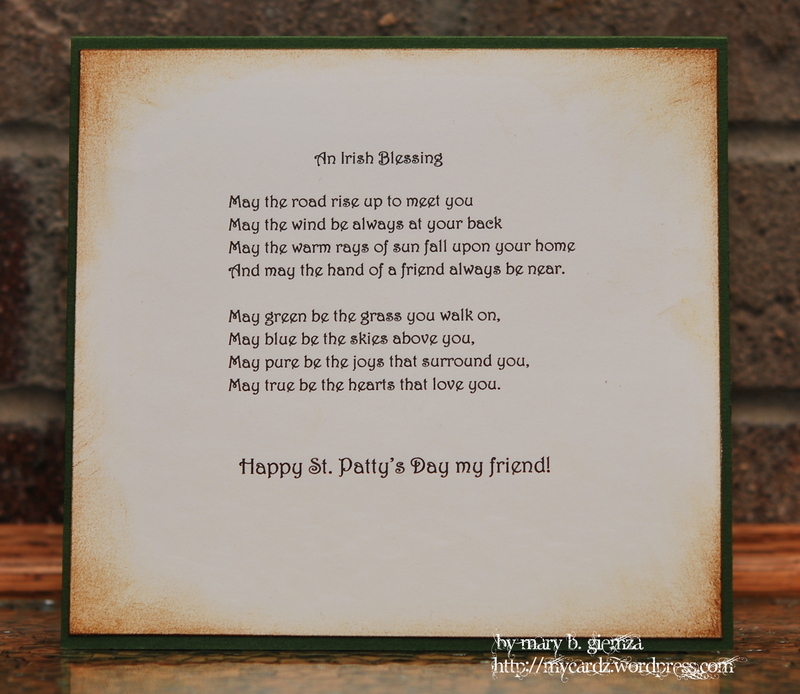 Each card you see on the blog hop today will be auctioned on E-bay with all proceeds going to the Red Cross in support of the Haitian Relief Effort. 100% of the proceeds from the E-bay auction AND $2.00 from every stamp set purchased from Skipping Stones Design, February 16 – 22, will be donated to the Red Cross. We know that we can ALL make a difference. 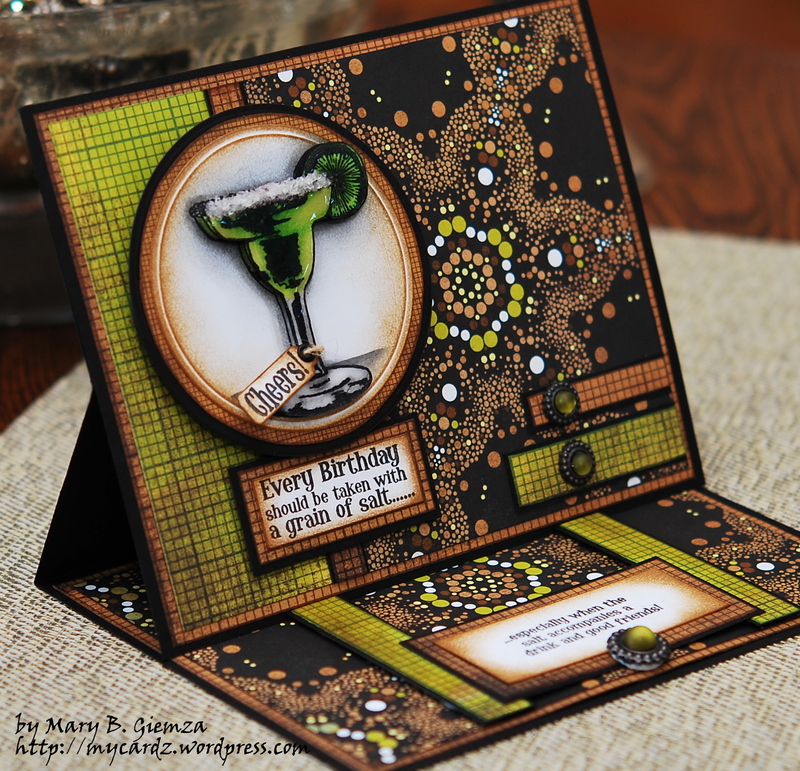 My card, using Skipping Stones’ Margarita Birthday set . 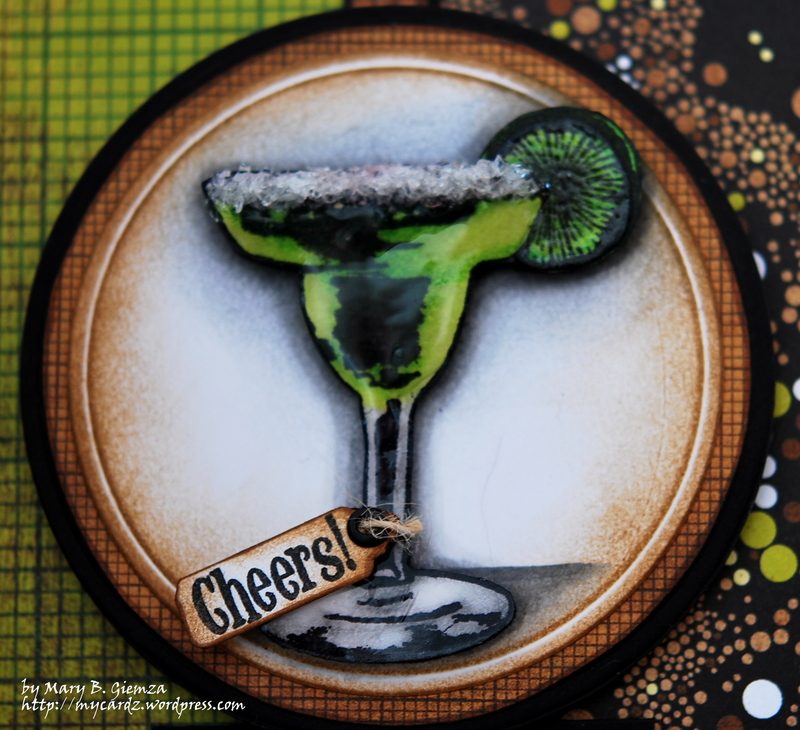 . .
A closeup of the YUMMY Margarita . . .
Side view of the Easel card design . . . 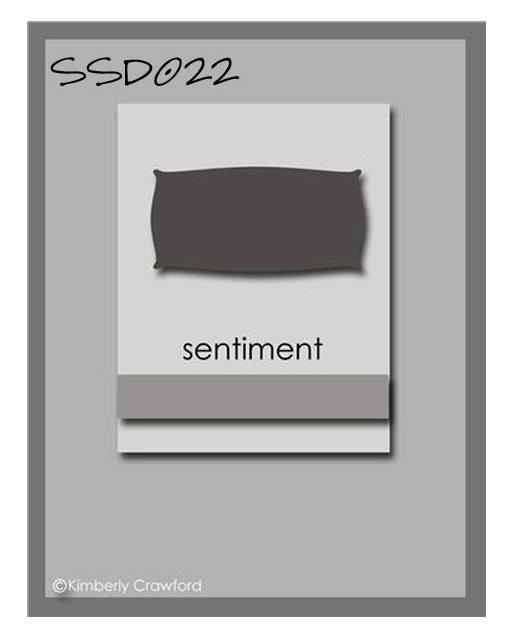 Inside sentiment . . . 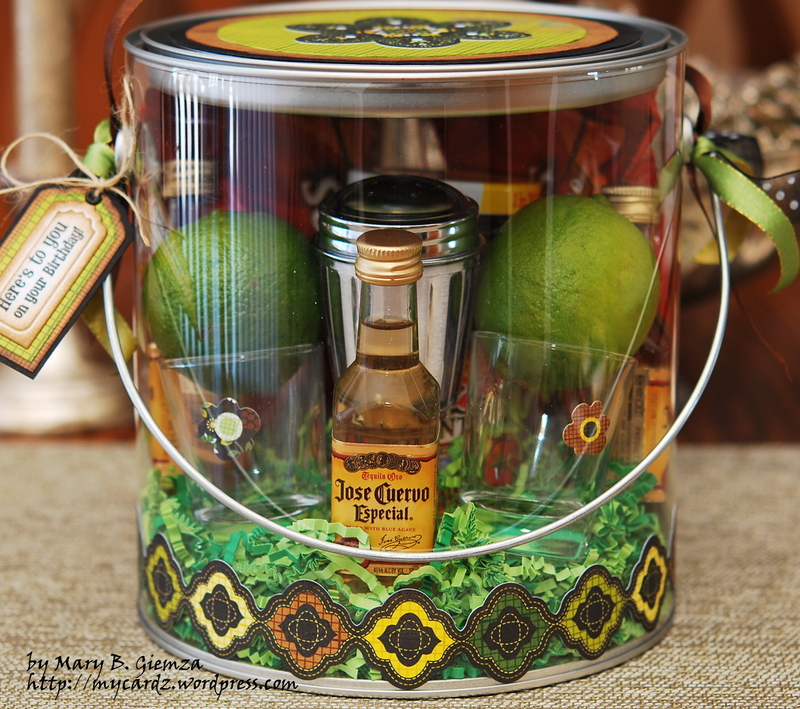 The extra little project ~ A gift pail filled with margarita essentials . . . 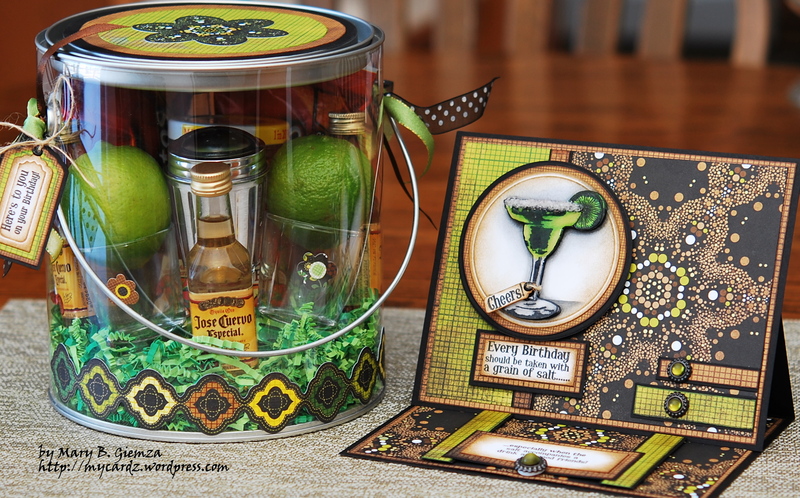 The tag on the gift pail, also from the Margarita Birthday set . . . Contents of the gift pail (all included in the E-bay auction!) 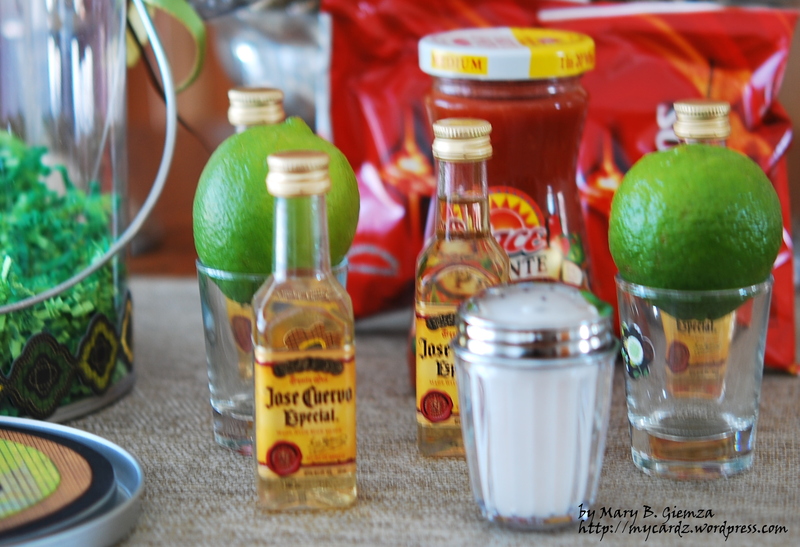 Four mini Jose Cuervo bottles of Especial Tequila, 2 limes, 2 shot glasses, a salt shaker, salsa & chips . . .
And one final photo of the complete set . . .
Soooo, how about a PRIZE for YOU? In addition to the fabulous eye candy, we have decided to hide a prize somewhere along the hop! There will also be a few pre-release sets up for grabs hidden along the blog hop. The fun part is … we’re not telling you who it is! So as you hop, be sure to leave comments on every post so you have a chance to win!! Thank you all for stopping by today for this GREAT cause! Your next stop is Jen del Muro. Embellishments: Vintage brads by Creative Charms; Super Fine Detail Clear EP; Diamond Glaze; Judikins ROX; Stampendous Clear 1 Gallon Tin Pail with Handle; Misc. ribbons & floss. 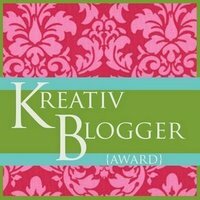 Next Tuesday, February 16th, 2010 we will launch a very special blog hop . . .
During Hop(e) for Haiti we can all work together to help raise money. The money will be donated to the Red Cross to help those still struggling to get basic needs met after surviving the devastating January earthquake. We will start our blog hop at Skipping Stones Design and visit the blogs of our Stamp Tramps Design Team and MANY specially invited guest bloggers. You are in for a treat with our special guests! 100% of the proceeds of the Ebay auction will go to the Red Cross. Please check back at Skipping Stones Design for updates. 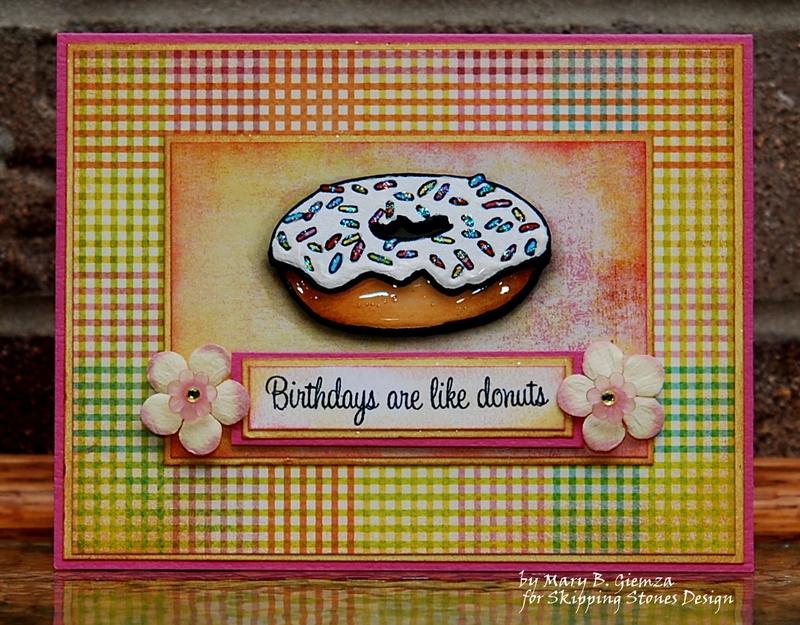 My card for today’s Sketch Challenge at Skipping Stones Design features one of my favorite foods – DONUTS! 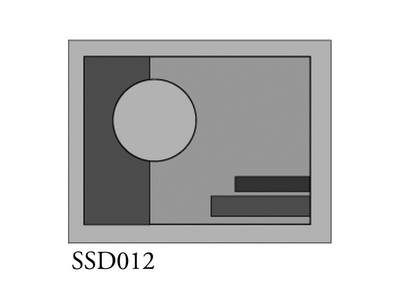 It’s from a new SSD set now available at a great price . . .
~ Buy Three, Get the Donuts for FREE! And, here’s my full card . . .
And the inside . 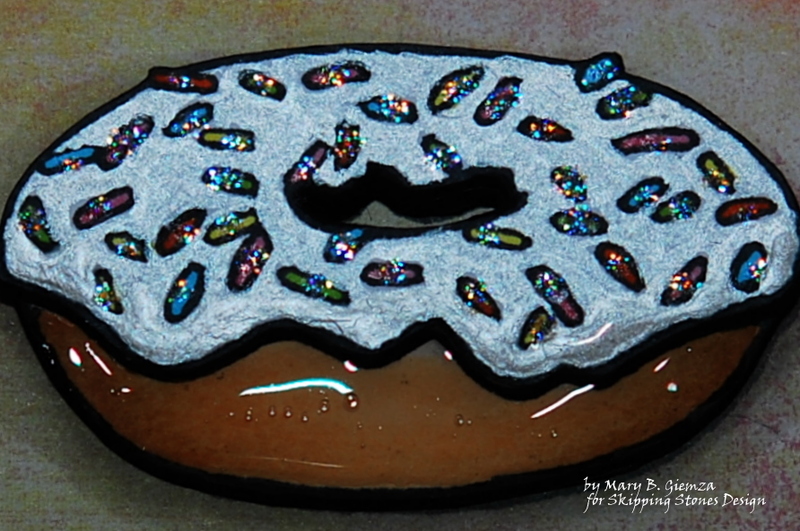 . .
As I mentioned, I used LOTS of Smooch paint in moonlight for the icing, LOTS of Diamond Glaze for the bottom of the donut (that’s my kind of donut, glazed and frosted!) 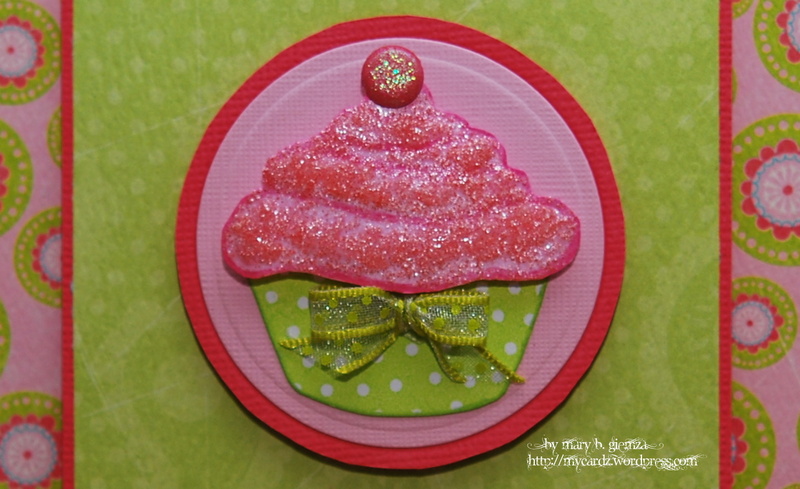 and of course, lots of sparkly sprinkles on top – highlighted with Star Dust Stickles. So better get your FREE DONUTS over at Skipping Stones Design … this offer is only good until Sunday, February 14th! While you’re there, don’t forget to check out the DT’s gorgeous cards.